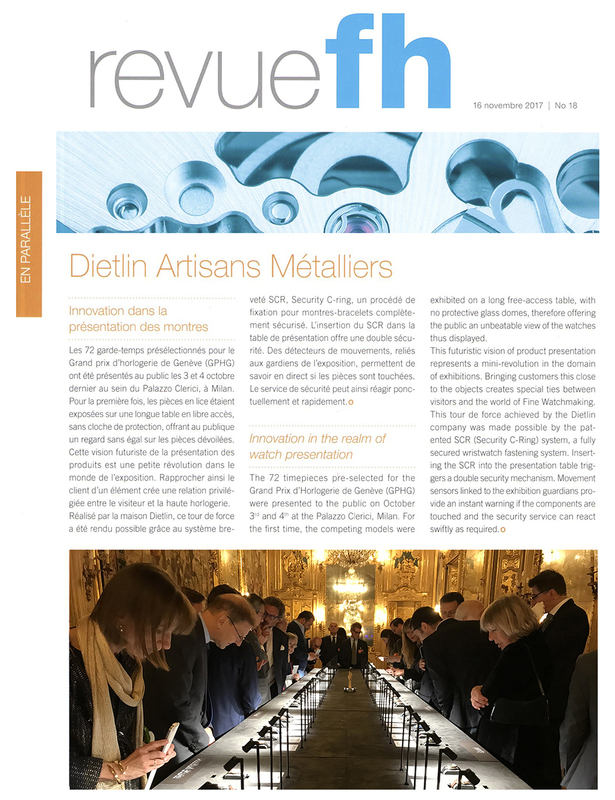 Dietlin Swiss Showcases - Revue FH: Security C-Ring, innovation in the realm of watch presentation. Revue FH: Security C-Ring, innovation in the realm of watch presentation. The 72 timepieces pre-selected for the Grand Prix d'Horlogerie de Genève (GPHG) were presented to the public on October 3rd and 4th at the Palazzo Clerici, Milan. For the first time, the competing models were exhibited on a long free-access table, with no protective glass domes, therefore offering the public an unbeatable view of the watches thus displayed. This futuristic vision of product presentation represents a mini-revolution in the domain of exhibitions. Bringing customers this close to the objects creates special ties between visitors and the world of Fine Watchmaking. This tour de force achieved by the Dietlin company was made possible by the patented SCR (security C-Ring) system, a fully secured wristwatch fastening system. Inserting the SCR into the presentation table triggers a double security mechanism. Movement sensors linked to the exhibition guardians provide an instant warning if the components are touched and the security service can react swiftly as required.